Mulgrew’s first order of business was tweeting to the press. He says he leaves it alone, but what we are talking about today is pointless if people are tweeting to the press. He doesn’t want to discuss why they do this, but asks that this not take place today. He asks that today people do it on good will, and that perhaps there be a resolution later. Can only conclude he does not enjoy my tweets. I understand completely. I don’t enjoy having no voice in my union, NYSUT, or AFT. I’ve just been asked to stop taking notes. I declined. Mulgrew says we will not fight only our funding, suggests we win fights because we are smart and strategic. Mulgrew is not letting governor know he is angry. Says Cuomo did us a favor because all his ideas have been tried and failed. Our strategy will be about education of other people besides teachers. Mulgrew says we are moving in better direction than we were in the Bloomberg years, that we will show how an urban system can be moved. Mulgrew says we are really under governor’s skin about how he doesn’t visit schools. He says we will continue, but be smart. He repeats smart. He claims this body, the DA, will lead this union. Mulgrew says we need to let parents know that governor and millionaire friends are hurting kids, that charter cap shouldn’t be raised because 2010 law not being followed. Ridicules phrase, “anti-creaming legislation,” and says governor must follow existing law. Mulgrew says colocated schools are inequitable. Facilities are unequal, but says charter piece is small piece. Predicts fight. Says we’ve been in them before. Goal of fight is to hurt other person more than we get hurt. Says that’s how he was brought up. Says we have come too far. We have been through all these fights, says on the main fights we have done this. Says we are not here to attack elected officials, except one, and that politicians will hear from parents and teachers. Mulgrew says budget in NY State is up or down. Requests chapter meeting to discuss what governor is proposing and budget process. Claims again that governor can do executive orders if budget is voted down on April 1st. That’s it, they’re done, he says. Mulgrew says we will have to build, Says he is a teacher. Speaks of his decision to work with needy kids. Said Cuomo’s suggestions will discourage teachers from going near poverty or need. High needs kids, kids with special needs will cause teachers to fail evaluations. Mulgrew suggests that if we get parents on our side, Cuomo will have made the biggest mistake in his political career. Mulgrew introduces several pointless computer displays. Then he focuses on Facebook pic I’ve seen a whole lot. Is it Cuomo or is it claymation? Cuomo refers to Cuomo failing bar four times, about how he blamed teachers in ed. school. Apparently he reads Arwen, whose post on that has gotten many, many thousands of hits. Mulgrew is advocate of test as teacher tool, he states. Maybe he forgot supporting NY APPR. He says testing now is what we are angry about, but we must be careful. When we say tests are bad, it’s saying our tools are bad, and that it’s only bad when morons use it. DA agrees tests are good tools for teachers. He says we need to be clear it’s our tool. Does not suggest we will punch people in face if they try to take it from us. Mulgrew bemoans test prep system. He says parents get it too, no art or music, and more money going to private companies. Mulgrew says we want eval. system that will help teachers. He says this is where we get to have fun. 80% of kids passing tests under Bloomberg. Were doing great. Gets to Common Core, says he testified five years ago, demanded standards, curriculum, training program. Says doctors are trained with new equipment and practices. Says CC trained no one and gave no materials. Said kids would fail tests, and not to blame us, but that governor did anyway. Governor is using budget process to weigh in on ed. process. Where was he when we needed funding. Mulgrew speaks of how many teachers leave profession, and how Cuomo does not address it. Describes Cuomo’s 15% principal, 35% “outside professional” proposal for evaluations. Asks how much it will cost to pay people to do 300,000 observations. Mulgrew says he wants to know why Cuomo wishes to extend probation. Says Cuomo wants due process to preclude any criticism of evaluation except math. Says parents don’t care about due process or 3020a but that hedge funders do. He says we understand eval. is important and we only want the best. Says we have to be clear 3020a does not take forever. Says he thinks “fast and fair” is the way to go. Complains of how long it takes teachers to be exonerated. Maybe he likes the ATR one-day due process. He says vast majority of charges are untrue, and it’s best we get them through ASAP. But no due process will make people not wish to teach. He says it’s OK as long as there is fairness. He says people going through 3020a are stigmatized and need to be welcomed back. Says we are 100% behind fast and fair. Expresses outrage at Cuomo’s statement that unions fought to keep sexual predators in classrooom. Says anyone guilty of sexual misconduct is fired. Mulgrew says parents have had it with charters. 75% not serving same students of need as districts. Says we should not make this anti-charter, but rather that everyone who takes public dollars be responsive. Says get rid of lottery and give preference to students of need same percentage as district. Why to charters suspend 10 times as many students as public schools? Why to they have attrition while we have overcrowding? Clearly charters are happy with that. Demands vacated seats be filled with students of need. Speaks of receivership. Says Cuomo will not fund schools, will then close them and give them to BFFs to run. Says collective bargaining agreements in such buildings will be null and void, and employees will be at mercy of whoever gets receivership. Will discourage teachers from going to needy schools. Mulgrew wants document almost no one has to be guiding document for chapter meeting. Gives us talking points. It’s great to be in a democratic organization where leaders tell you what to say. Saves you all that time-consuming and inconvenient thinking stuff. Maybe I should sign a loyalty oath, like most of the people in this room have. Second person asks me to stop taking notes. I decline again. Woman next to me taking notes on cell phone. No one asks her to stop, for second time. Governor states he was forced to do this because test scores have plummeted. That teachers don’t want to be evaluated, accountable, that they favor sexual predators. Mulgrew says parents ask, at local level, can we have teachers as partners to do presentations. Wants us to understand that parent questions will be different from member questions. Says they asked if we could demonstrate in NY and in Albany. Says he has no problems demonstrating in winter but suggests March. Says parents suggest we demonstrate at 3 PM in front of public schools. Says campaign will entail various groups and strategies, that Cuomo was caught off guard. Says each borough will come up with own team that will volunteer to work with every PTA, coordinate with parents, have action calendar with each region. Mulgrew concludes we are all teachers and up yours, we’re going after this guy. Says he has research and articles to prove this is a bad idea. Says we’re in a fight, we will get hurt. Goal is hurt him more and move education forward. States principals are having issues when they are not collaborative. Mulgrew has PowerPoint presentation for members. Says it is grassroots (when we use his talking points, apparently). Mulgrew says we serve all kids, that no one is pushed out of our buildings. Question—sounds like we only have two months, CL says it would be helpful for Mulgrew to write letter, wake up members. Requests weekly action. Mulgrew says do you want to do this or work with parents organically. Says we are doing Moral Mondays every week already. Suggestion—we have in NY teacher where we express positives, but why not get this out to parents, to city? Mulgrew will talk to NY Teacher folks, says it would have to be electronic file because mailing is expensive. Mulgrew compliments members on social media (in which he did not participate). Question—what would Cuomo have done if we had endorsed him? Mulgrew says it wouldn’t have been the same. Mulgrew says you don’t go to all out war with mayor and governor at same time, that Cuomo is playing politics with education. Says Cuomo is putting out these policies because we didn’t endorse him. Mulgrew suggests statewide informational picketing one day. Mulgrew says Cuomo did not place renewable tenure on the table. Suggestion—talking points for parents be in Spanish. CL asks to invite local pols since Cuomo won’t come. Mulgrew suggests a “Where’s Cuomo” thing. Says he got 84 detentions one year and is a mischievous union president. CL wants to encourage members to call elected officials. Requests UFT talking points. Mulgrew says everything is negotiable up to April 1st. States Cuomo is getting killed on 50% test scores and that Texas is going down to 20. MORE’s Jia Lee. Says she recently spoke at Senate hearing. Says there is huge opt-out grassroots movement, Mentions high-stakes testing forums. Offers flyers, volunteers to help. Mentions 21 locals locals have passed I refuse resolutions. Mulgrew says she can raise resolution in two weeks. CL—asks for UFT funding for parent outreach. Mulgrew says he will support actions coming from schools. Requests planning and policy making committees. Marjorie Stamberg—informational picket lines oxymoron. Picket lines mean don’t cross. Mulgrew says, you’re right, it’s informational leafleting. Stamberg—we should picket. Says all pols want to bust unions and privatize education. 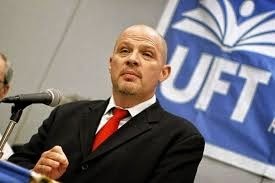 Comment—UFT has organizing committee that comes into schools. Mulgrew—we will organize, come up with regional plan, says everyone’s agreeing there will be a chapter meeting on governor’s agenda. Asks for volunteers to work with parents. Asks that volunteers be trained before they do that. Will be citywide and regional actions, says that’s what he heard today. Asks for motion, we support these actions, passed. Says we will not let governor ruin education, will rue the day he proposed these plans to the people of NY.